Omni popular Lino lada milk is the only white spread in the market, so its popularity is no surprise. It owes its irresistible taste and texture to milk ((whole milk powder 18%) and the finest hazelnuts. Calcium from the milk is irreplaceable in our body for building bones and teeth. 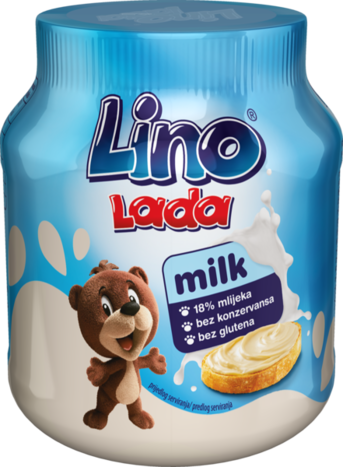 Lino lada milk provides you abundance of energy, which will undoubtedly bring it to the menus of athletes and children, but also of all the fans of desserts. It can be eaten as a bread spread, for filling pancakes, with ice-cream, for preparing delicious cakes and desserts, or as a treat on its own. sugar, whole milk powder (18%), sunflower oil, hazelnuts (9%), whey powder, vegetable fat (palm, soy), fully hydrogenated rapeseed fat, emulsifier: soy lecithin, flavourings. Storage: in dry place at 15 –20°C, do not expose to the sun. Shelf life: package 20 g: 10 months as of production date. Other packages 12 months.